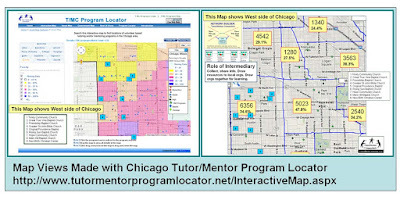 Tutor Mentor Institute, LLC: Who Has Youth Program Availability Maps and Directories? Who Has Youth Program Availability Maps and Directories? 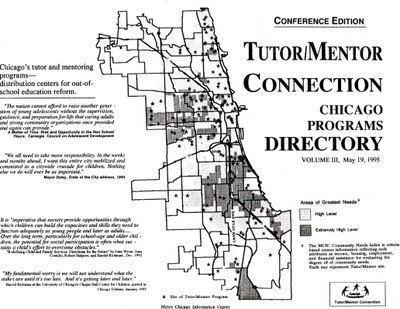 Below is the front page of a Chicago Tutor/Mentor Programs Directory that the Tutor/Mentor Connection published annually from 1994 through 2002 and has maintained on-line since then. The goal of collecting and publishing this information was to provide information that leaders, policy makers, business and resource providers could use to support the growth of well organized non-school tutor/mentor programs in every high poverty area of Chicago and its suburbs. A side benefit turned out to be that it was a resource parents, social workers, volunteers and donors could also use to find information about existing programs in different parts of the city. 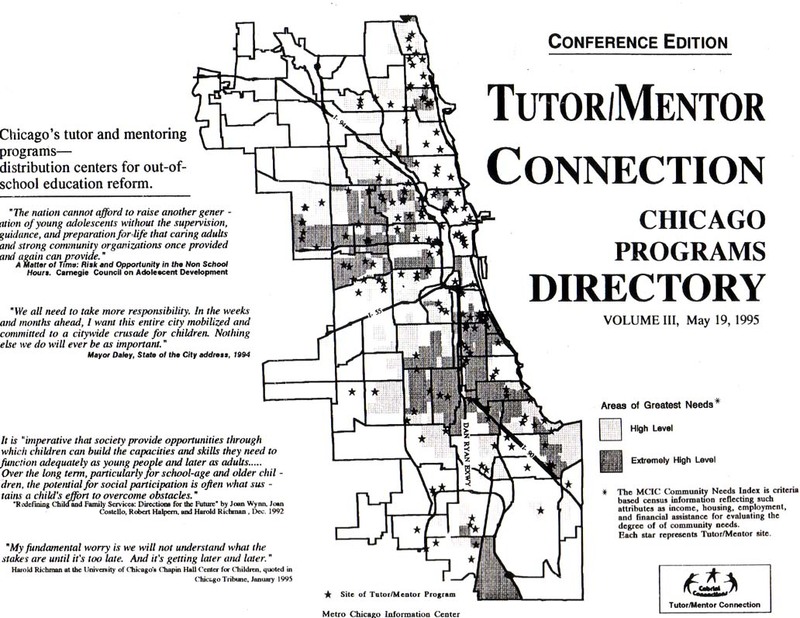 While my map shows only Chicago, I've been trying to find information about existing tutor/mentor programs in the surrounding suburbs, too. There's not much there. We could only mail a printed directory to about 350 people and once printed it was out-of-date. It was not searchable either. We started putting our list of organizations on the Internet in 1998 and, in 2004 we launched this page, which enables anyone to search the directory to find contact information for programs in different zip codes of Chicago. Our programs survey asked what age group you serve (elementary, middle, high school) and what type of program you operate (pure tutor, pure mentor, combination tutor/mentor) along with where you were located (address and zip code). 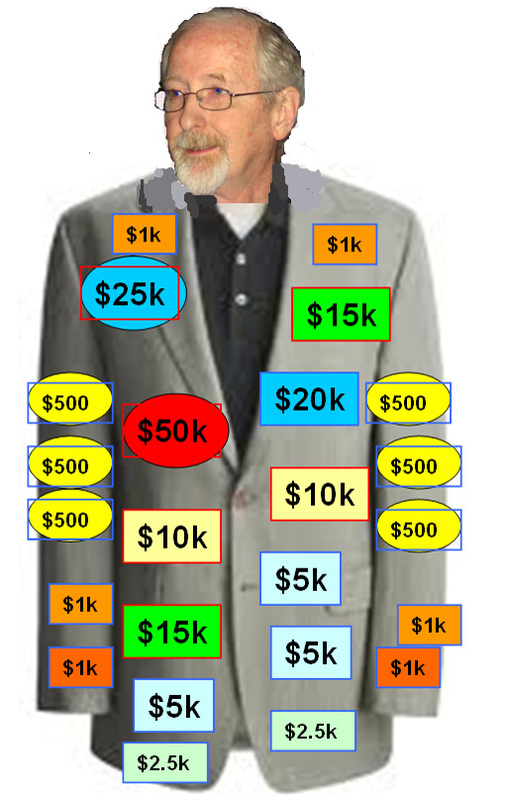 Thus a search could narrow down what someone was searching for by these criteria. The search would produce a map showing locations and contact information for programs in the zip code being queried. 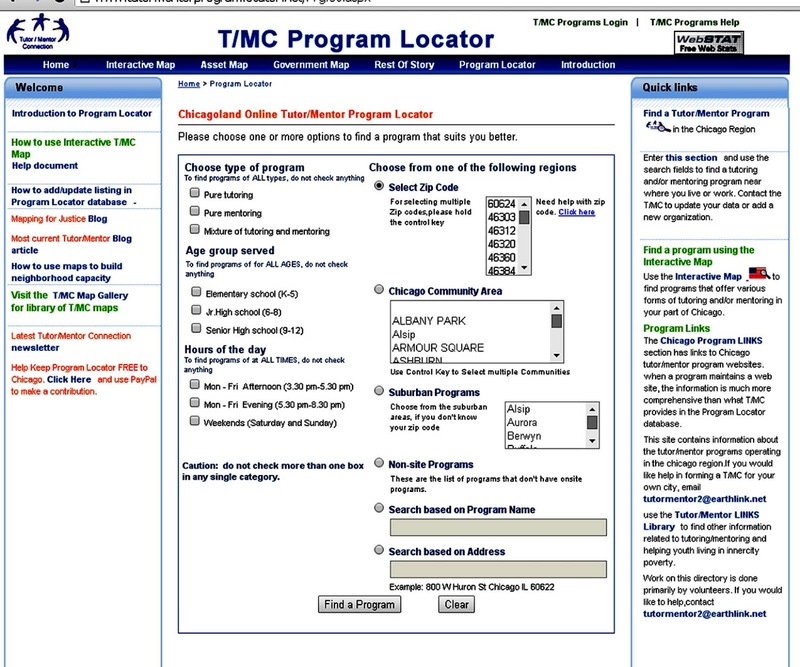 There were several ways to search for program information. 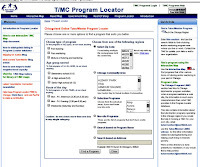 See instructions for using the Program Locator on this page. The 2004 platform worked like any other search engine. If you know what you're looking for you can find it with a few searches. However, this did not serve the primary goal of the Tutor/Mentor Connection, which was to talk about the availability of non-school tutor/mentor programs in all high poverty areas of Chicago. 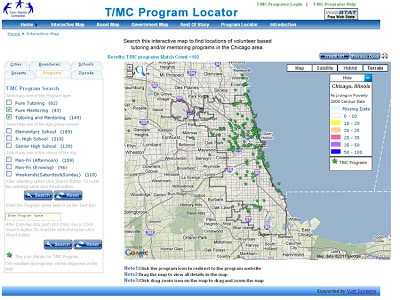 Then in late 2007 we received a $50,000 anonymous donation, and used half to rebuild our desktop mapping capacity, and we used the other half in 2008 to build an interactive Chicago Tutor/Mentor Program Locator, that started with a map showing all of Chicago and included locations of all of the programs in our Directory. The interactive map enables people to build their own map view, by adding layers of information, such as poverty levels, poorly performing Chicago Public Schools, and existing programs. 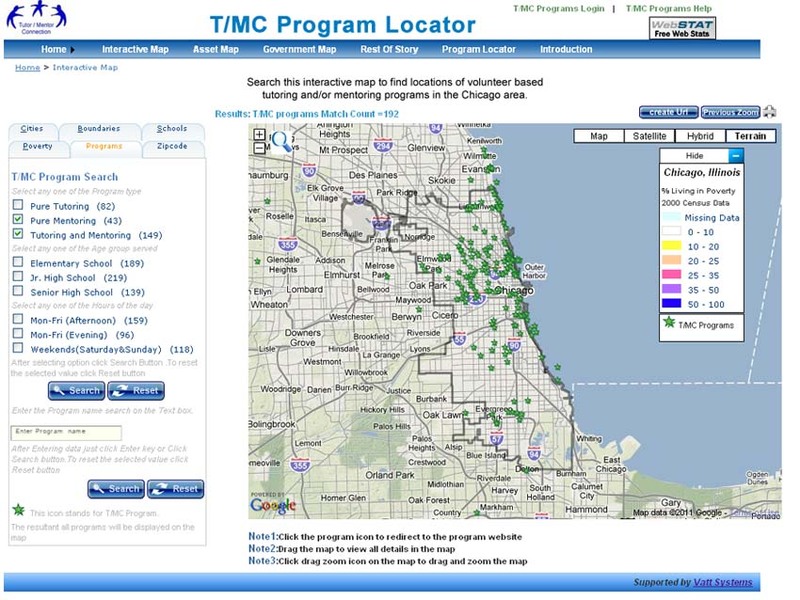 You can search this for the same criteria as the platform launched in 2004 and you could zoom in to specific parts of the city to create map views intended to show availability of programs along with assets who could be helping programs grow (business, faith groups, hospitals, universities). 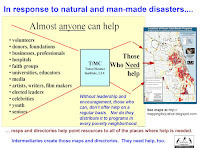 In the two map views shown below, you can see that additional layers of information can be added to the map, and incorporated into articles like this, using PowerPoint and Adobe Illustrator. Due to financial and other circumstances I had to create the Tutor/Mentor Institute, LLC in 2011 to keep this resource freely available to Chicago but I've not found partners, investors and talent to update it since 2013. Both search platforms still work. The data is just not updated. It serves as a model of what's possible. I encourage you to spend time seeing how it work. 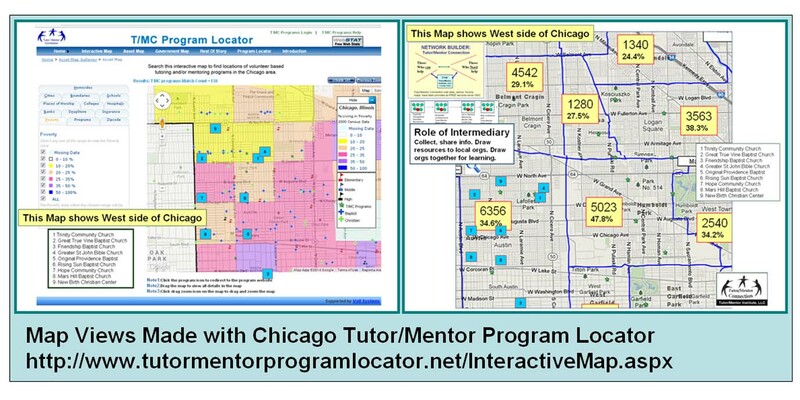 In the meantime, I've created another map that shows programs in Chicago, and maintain a list of nearly 200 Chicago youth tutor and/or mentor organizations, which is more updated. See it here. Browse articles tagged maps and violence on this blog, or articles written from 2008 to 2011 on the Mapping for Justice blog, and you can find many examples of how the Program Locator can be used. I offer this introduction as part of a question. Is anyone else collecting and mapping information about youth tutor, mentor and learning programs all the ways I do? I've been including maps in stories since 1994. 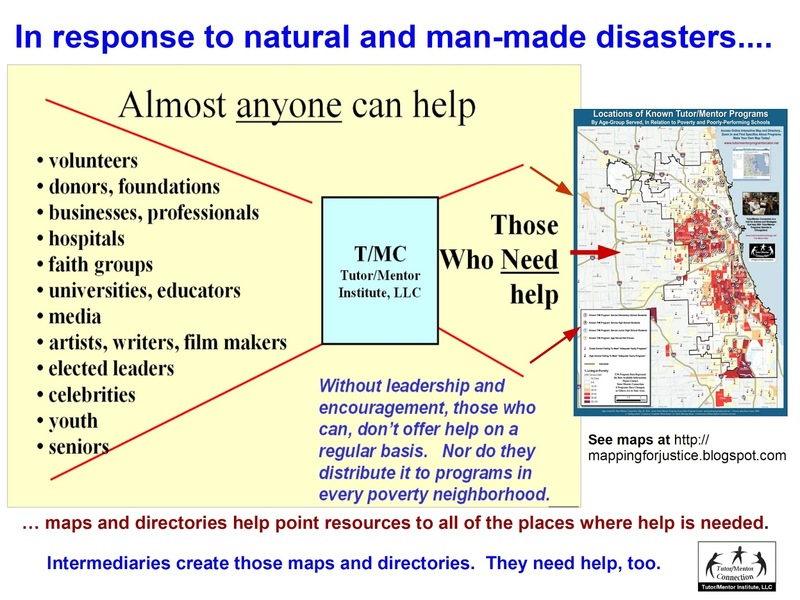 Is anyone using their maps in on-going stories intended to build awareness and draw volunteers and donors directly to the web sites of individual programs, where they use information being shared by each organization to decide which programs to support and what ways to support them? My maps focus on Chicago and are a model any big city could duplicate. However, since many rural areas and smaller communities, as well as Native American Reservations, have youth who could benefit from the support offered by a well-organized tutor/mentor programs, I also seek to learn if anyone is building a directory of programs focused on these populations. Back in 2011 when I launched the Tutor/Mentor Institute, LLC I created this graphic suggesting that sponsors could support the work I was doing, the same way they support sports teams, golfers and race car drivers. So far I've not found anyone who would do that, which is one reason the Program Locator is not up-to-date and too few people even know it exists. It's also a reason other cities are not using the same tool and process. If anyone wants to reach out and help me do this work I'd love to hear from you. If you have information about others collecting information like I do, send me the links and I'll add them to the Tutor/Mentor Connection web library and try to connect with those groups on Twitter, Facebook and/or LinkedIN. If you'd like to make a mid-year contribution to help me, here's a page with a PayPal link.